From September 19th to October 14th, conservation works were conducted at the National Museum of Antiquities of Tajikistan to the wall painting fragments excavated from the Khulbuk site. 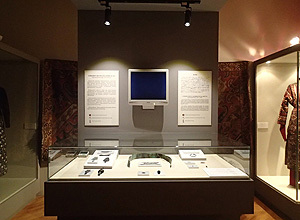 These wall painting fragments are assumed to have been produced in the early Islamic period. Since a limited number of wall paintings of this era have been found, this wall painting is very important from historical and art historical points of view in Tajikistan. 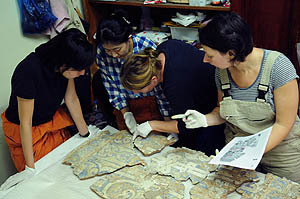 NRICPT has been earnestly conserving the wall painting fragments since 2010. The wall paintings were excavated in fragments. When conservation work initially began, paint layers and the white plaster layer as a ground were extremely fragile. In the previous projects, the work such as consolidating the paint layers, jointing broken fragments together, and attaching a new backing had been carried out. This year, artificial renders imitating earthen plaster were applied on the backs of wall painting fragments for further stabilization. By this operation, the fragments in the various thicknesses were standardized to the same thickness, and it allowed the surface height of the fragment consistent for exhibition. Moreover, the defective and joint parts of fragments were filled with gypsum-based grout. The filling surface of the fragments was painted regarding the color balance of the whole painting which consequently made the image easier to see. 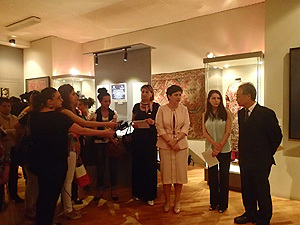 In the future, plans are to explore ways to safely exhibit the fragments at the National Museum of Antiquities of Tajikistan. 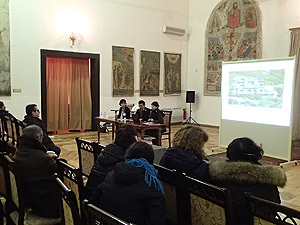 Part of this conservation project was undertaken with a Sumitomo Foundation Grant for the Preservation and Conservation of Foreign Cultural Properties.